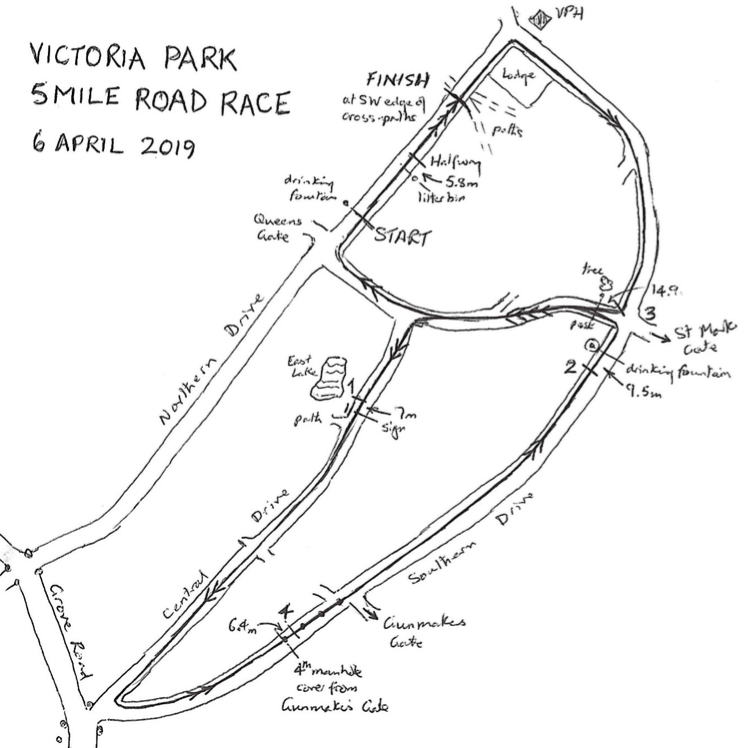 The course consists of two figure-of-eight laps plus 245.5 metres, giving exactly five miles in total, as certified by the Association of UK Course Measurers. The course is mainly level and smooth, and is suitable for wheelchair racers. START: Northern Drive, level with drinking fountain on left (north of Queen’s Gate). 1 mile: Central Drive, 7m before ‘Wildlife of E Lake’ sign on right by path. 2 miles: Southern Drive, 9.5m before drinking fountain on left before St Mark’s Gate. Halfway: Northern Drive, 5.8m past litter bin on right between S&F lines. 3 miles: 14.9m before post on right with green sign after right turn at St Mark’s Gate. 4 miles: Southern Dr, 6.4m past 4th manhole cover before Gunmaker’s Gate. FINISH: Northern Drive, at south-west edge of cross paths. This site is hosted by GitHub Pages and uses the Holy Grail Liquid-Layout: No quirks mode by Matthew James Taylor.